Building a community is hard work. Imagine a room of 100 hungry, tired and opinionated toddlers, and then try to create a place where every child walks around with a smile on their face, content with their surroundings. This is essentially what building a modern community is like. When community leaders sit down to plan out how to better develop their city/town/state, they have a lot of things to consider. Public safety, public health, infrastructure, logistics, opinions (a lot of those), industry needs, residential needs, quality of life enhancements – the engines of growth that make this “machine” move in the right direction, forward. Community leaders, volunteers, officials and stakeholders can all be considered the “builders” of a community, and the community itself a monstrous machine. To build, maintain, fix, and continue to develop this machine, the builders have with them an equally large tool box full of helpful instruments that assist in measuring, tightening, loosening, adjusting, fixing and building additional components. For the builders of a community these tools include things such as sewer lines, power lines, asphalt, garbage trucks, police cars, hospitals, fire stations, arts centers or councils, parks, zoning requirements, codes, laws, regulations, city hall, and … wait a minute, what did I just say? “Arts centers and councils”? If anything, every blog post I’ve written, and probably will ever write dealing with the arts, is aimed at one goal – getting the general public to start thinking differently about the arts. No more should someone see the arts as a sign of solely a “healthy” or “successful”, or “rich” community. The arts are not solely a sign of success; they are not an amenity; they are not “frill”; they are not “elitist”; they are not something to be ignored. The arts are one among many tools to be used by communities at all stages – developing, new, young, old, successful, trying, struggling, perfect – to assist their “builders” in constructing the framework of a place that is more than an interstate stop, more than a point on a map – but a place; a place called home, a place called vacation, a place that puts a smile on every “toddler’s” face. Notice something very important I said earlier – “…one among many tools to be used by communities…”. The arts are in every community’s tool box, but it is up to its leaders to take out the arts and apply them to their “machine”. A community that ignores the arts as a tool in its toolbox, but rather regards the arts as an “added benefit” neglects not only the functionality of its community, but sets their community afloat without any agent to bond the people together. Because a community that doesn’t acknowledge art as a vital component of infrastructure, or at the very least an important part of their “machine”, is broken before it’s even turned “on”. When successful communities revitalize themselves, re-identify themselves, or develop themselves, they include the arts. One only need to look in their backyard for proof. Greenville is the perfect example of what is possible when the arts are viewed as a tool and not as “frill”. Meanwhile, Fountain Inn is well on its way of capitalizing on their arts offerings, and right here in Mauldin, we’re working hand-in-hand with our community leaders to ensure that our programs at the Mauldin Cultural Center are geared towards strengthening our great community. I urge you all to start looking at the arts differently. Participating in the arts doesn’t merely help advance our organization’s mission, but it helps advance your community. 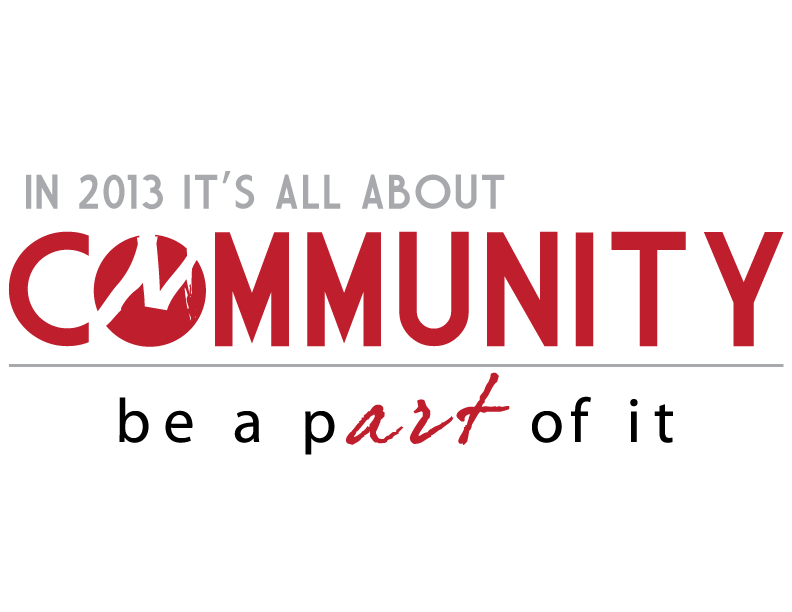 In 2013, it’s all about Community at the Mauldin Cultural Center, be a pART of it.